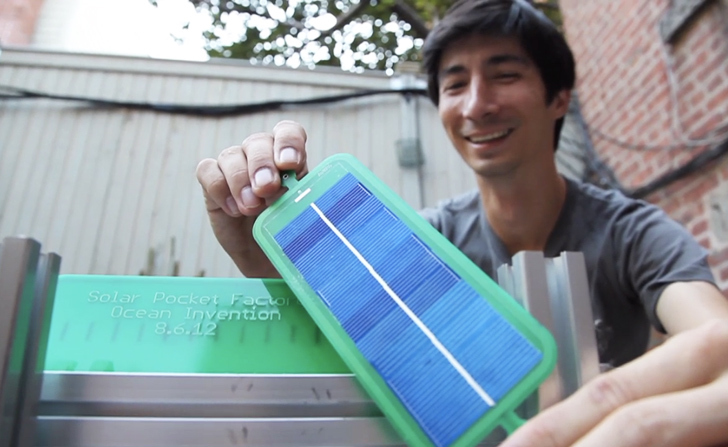 Inventors Shawn Frayne and Alex Hornstein are looking to revolutionize the business of small-scale solar panels with The Solar Pocket Factory, a backyard photovoltaic panel printing system. Successfully funded by a Kickstarter campaign, the two have placed themselves at the forefront of the micro solar movement, which aims to cheaply and quickly produce small PV panels. Enthusiastic about all things solar, inventors Shawn Frayne and Alex Hornstein have built everything from lights to USB distribution grids. Through the process of designing and manufacturing their products, they found that the micro solar panels they used to power their devices were brittle, expensive, and poorly made. Taking matters into their own hands, they traveled the world and spent months researching current models. They found that half of the cost of conventional panels lay in their assembly, as many parts of the body are pieced and soldered by hand. They also observed that 15% of panels contained flaws from imperfect soldering, and in many cases, the materials used were cut-rate and disintegrated over the period of a few years. They figured that if they could automate the production, they could eliminate 25% of the price tag and reducing the number of defects. By using higher quality materials, they could also create panels that are more efficient, gather more light, and last longer. The result of their labor is The Solar Pocket Factory, a small automated machine that can churn out panels on a smaller scale than a sprawling factory. The device resembles a desktop 3D printer, and the team hopes to have a full working model completed by April. When finished, the Solar Pocket Factory will be able to churn out a panel every 15 seconds – that means that just one machine could potentially power 1 million devices each year! Viva la revolucion! You can make it. look for inplix website! I think it's the best way to learn how to make it in the better way. would be interested in more information on these. thank you. would like to know more about the availability of the DIY Solar Pocand the cost of materials for the end product. Please email me. Affordable power for 3rd world countries? I am a missionary in Central America and would like to know more about the availability of the machines and the cost of materials for the end product. Please email me. Sadly big corp will offer them a bundle of money and will burry their system for endangering their own industry.